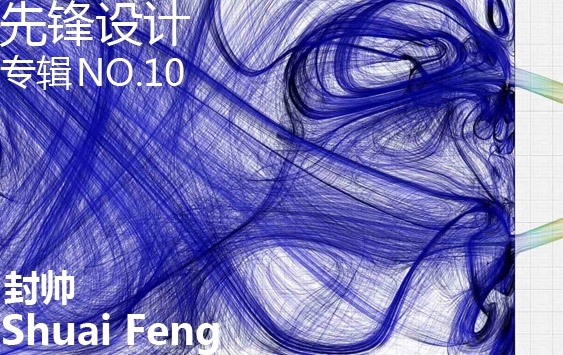 The tenth issue of the Pioneer album presents you with four wonderful works by Feng Shuai. Tree House (2004) was submitted for the structural course, in the second year. The concept was to limit and re-generate structures through lines of sights in a small scale building, with inputs including views to the stage from the auditorium, and views towards the skies along the paths underneath the auditorium. The resulting generated structure took a ‘tree’ form. Large-scale physical models were created for structural analysis and light diffusion simulations. Aseismic/Acoustic Structure(2008), is work conducted by the studio of Yufang Zhou. The complex roof structure was formed by a cluster algorithm based on the gradient of solar irradiation intensity and pedestrian densities, to achieve differentiated shading and noise-reduction respectively. Large-scale physical models were constructed to further examine the structural performance of the flexible joints and their threshold of deformation. This project aims to investigate a new microclimatic strategy for the proposedconcourse of the Waterloo Railway Station in London, UK. A hierarchical branchventilation system set within the shell surface acts like a turbulence damper, enhancingthe stability of the air flow supply. The concrete shell incorporates a differentiateddistribution of fibre and aggregate materials, whose distribution corresponds to thearchitectural programmes housed underneath. A computational method is developed in order to modify the concourse’s envelope formby deforming it towards the prevailing wind direction, while simultaneously promotinglocal variations according to programmatic demands. Computational Fluid Dynamicsanalysis was deployed to investigate ventilation pattern in relation to the aerodynamicarticulation of the volume, the placement of inlet and outlets points and the branchingpatterns of the air ducts. A large-scale, variable section slip form casting machine isdeveloped for multi-aggregate embedded concrete to be cast into doubly curved shellsurfaces. The author proposes a new application for airflow engineering in architecture: harnessing constant and steady airflows from the integral surface layer where turbulent winds are generated, through simple Biomimetic approaches. Biomimetic technology can offer inexpensive and simple solutions, which would otherwise require elaborate engineering solutions with high capital and operational expenditure. This is counterpoint to traditional wind engineering philosophy, which captures reliable wind energy from high-rise locations with highly capitalised wind turbines. Within architecture and engineering, winds are into simple empirical models, depicted as a vector with implicitly predictable velocity and direction. In fact air movements are dynamic and constantly changing. This unpredictable nature of wind is generally regarded as ‘inefficiency’. Within nature, such ‘inefficiencies’ can elegantly and resourcefully be regulated, as demonstrated within a termite mound. In order to enhance the stability of ventilation, the termite mound is embedded with a complex hierarchical vascular tunnel network, damping gusts of wind into constant steady flow supplies. Waterloo Station, one of the largest railway terminals in the UK, is situated on London’s South Bank, Waterloo’s location within the urban heat island, and its proximity to the river Thames – a cool body of water – results in cyclical convection winds between the land mass and river, occurring and reversing night and day. Founded on fluid dynamics research, a computational method was developed aiming to optimise energy savings by modifying the existing form of Waterloo Stations concourse and envelope. This was achieved dynamically by deforming the form towards the prevailing wind directions on either side. In addition to form-finding, Computational Fluid Dynamics (CFD) analysis was deployed to investigate ventilation patterns in relation to the aerodynamic articulation of the volume, the placement of inlet and outlets points and the vascular patterns of the air ducts. Spatial continuity was created by merging the four vertical programmatic layers of the station concourse into one continuous geometrical and topological surface, offering the potential to transform the spatial experience by varying microclimates. Meanwhile, the use of pedestrian simulation, calibrated by on-site weekly synthesized photometrology, highlighted the necessity to revise the positioning of the waiting lobbies. These were relocated based on the aforementioned fore-and-aft pedestrian movement. Consequently, a variety of programmes were reorganized, informed by simulation patterns. Each of the concourse’s were ranked based on pedestrian density, velocity and direction requirements in relation to a variety of spatial and environmental parameters including; volume, height, width/depth, illuminance, temperature and ventilation. A diverse set of space typologies emerged, sometimes with conflicting requirements, which resulted in an array of optimised forms, resulting in a hybrid shell form informed by the activities housed within. The continuous surface creates a landscape that spreads up above the surged entrance to the underground tube, forming a topography that can include a plethora of rich cultural spaces from temporary art galleries to children’s theaters. The uninterrupted topology of the space acts as a guide for commuters and a complex culture-enriched social hub mixed with the necessary information checking, shopping, catering, entertaining, performing, exhibiting, communicating and celebrating within one of the busiest public space in Europe. In 2008, 187.236 million passengers travelled through Waterloo station. The body energy generated from half million commuters travelling through the concourse every day radiate enough energy to keep the enormous concourse shell at a constant temperature of 22-25 degree Celsius, if properly insulated. In order to harness this energy, high thermal mass was used through the concourse. This was employed in allocated patterns generated by pedestrian simulations, which was driven by a microclimatic strategy. The simulations were calibrated by weekly, on-site synthesized photometrology, in order to achieve a damped fluctuation in temperature between ‘peak time’ and ‘off-peak time’, meeting demands of differentiated activities. Evaporative cooling, coupled with vigorous ventilation occurs naturally in dogs during respiration. With lungs driven at a very high frequency to specifically match the resonant frequency of the thoracic cage, dogs can retain the transient turbulence within a short distance into its airways, enhancing the evaporation for cooling. Inspired by this, porous material was deployed at the outer surface of the concourse’s shell and distributed in gradients around the region where high eddy patterns were more sturdily produced. With its high water-absorbance capacity it can reduce the collected rain water loss, therefore allowing for higher evaporation levels which can then cool the air supply. Hierarchical Biomimetic Vascular ducts are located around the faces that receive the most intensive solar incident radiation. These can then trigger thermo-siphon ventilation phenomena during the early morning and late afternoon’s rapid heating hours, while simultaneously allowing sunlight to penetrate through in early morning, but get bounced in late afternoon. Placed between the densest terminal vascular ducts, they aim to comply with the strict requirements regarding illumination intensity and air changes for large crowds. Due to the differentiated gradational transformations, the lighting quality fluctuates through the space in different densities. The resulting concrete envelope is gradationally translucent with fine vascular veins creating ever changing material palette of diffused daylighting and coloured shadows, serendipitously showing the ever-changing flows of the moving city outside. At night the envelope metamorphoses into a glimmering patchwork of darkness and sources of light both mysterious and omnipresent. In animals & plants optimal resource distribution is achieved by a bifurcating hierarchy of network branches. The bifurcating Hierarchies are further optimized in radii and length to minimize the flow resistance. This is based on the ‘design rules’ as described by Scaling laws etc. The terminal units of the network applied in the concourse shell are not like that in capillaries’, but still aim to allow regulation of transient flows of wind within the required environmental performance. Four Hierarchies of vascular ducts are designed to control the air, from the discharge zone on shell’s outer surface through to the numerous terminal units, the frequency increasing proportionally to the proximity to the waiting lobbies. The construction of the concrete form will utilise a customised large-scale, variable- section slip form casting machine developed especially for multi-aggregate embedded concrete, which will be cast into doubly curved shell surface, reducing waste material, labour and time with minimal scaffolding. Horizontal slipping direction avoids the material redundancy in vertical casting. In order to further reduce the construction scale to save costs and labour, the concourse is divided into 13 pieces cutting along the long axis, with each spanning across 15m, constructed separately and get rejoined. A section of the most dramatically bifurcated slab is to be investigated further. The lower slabs are first casted upon the ‘pedrail’ formwork, which is then lifted by hydraulic elevator trusses along tracks, sliding back to the bifurcating position, ready for casting the upper slab with a varied section created by the variable ‘pedrail’ formworks.The hierarchical vascular duct system, is achieved by melting the sacrificial polystyrene moulds buried within the concrete. The seam line of the formwork left after casting, function as guiding lines for the commuters. Initial Design/方案设计：Shuai Feng (封帅), Ittai FrankTeam/团队(alphabetic/字母降序): Selim Bayer, Kunkun Chen(陈鲲昆), Stéphanie Chaltiel, Utssav Gupta, Konstantinos Karatzas, Mohamad Khabazi, Tamara Lavrovskaya, Mohammed Makki, Maria Mingallón, Michael Moukarzel, Sara Pezeshk,Sakthivel Ramaswamy, Jheny Nieto Ropero, Revano Satria, Kyle L. Schertzing, Pavlos Schizas, Xia Su(苏夏), Ioanna Symeonidou. Tutor/老师: Michael Weinsock Consultant/顾问: Wolf Mangelsdorf , Michael Brooks, Luke Epp, Martin Flint, Victoria Littlewood, Andrea Menardo, Jonathan Vidler. (Buro Happold/英国标赫工程) Sponsorship/赞助: Architectural Association(AA 建筑联盟学院), Buro Happold(英国标赫工程), ‘Unto This Last’ CNC(英国永续家具工坊), Alec Tiranti Ltd resin and glass fibre(意大利艾利克斯提拉提建材) . The AA Canopy 2009 has 9 proposals entered as candidates. Structural engineers from Buro Happold spent one month assisting the 3 final schemes to enhance the engineering design. The winning entry had an opportunity to build a one-to-one scale model; fabricated, assembled and constructed by all the students involved. The winning scheme attempted to provide partial shelter from the rain, shading from the sun and mitigate the wind for the AA upper terrace- the central public area of the School. The cascading overlapped structures of decorated gateways in the streets of Beijing form a complex and delicate system to offer horizontally structural overhanging that performs as a shading device, whilst sloping properly for draining. Vernacular houses in Shanghai use spaced tile work, giving porosity to the roof, while incorporating drainage with air exchanges through the roof surface. Partially distributed transparent tiles also locally adjust the interior daylight levels. The experimental example of the AA canopy has exceeded expectations of precedent: the overlapped composite wooden stripes behaved as a structural system, meeting the high strength requirements that structural overhanging demands. It also performs well environmentally, guiding rainwater drains along the overlapped cascading paths, and providing layered diffuse light effects and maintaining a damped wind environment beneath it on the terrace. This is trying to recall the atmosphere of sitting under tree boughs, as sunshine forms shadows that dance and spin on the ground, and cool breeze whispers through the branches. The design development of the project included two research paths: Genetic Algorithms and physical experiments based on material properties. The iterative process of design applied advanced computational tools, deriving input parameters from spatial arrangement and the environmental conditions of the upper terrace. The initial surface was generated after 20 successive iterations, to minimize wind load, and to form a slope to direct the rain to the drainage gutters. Computational Fluid Dynamics (CFD) simulations were used to assess the consequences of each geometric modification, the associative digital model progressively reduced the turbulence under the canopy, and enhanced the stability of the air supplies. The differentiated surface porosity patterns were then created following the wind pressure gradients cast on the initial surface, and so reduced the wind load in the most critical areas to enhance its structural capacity, preventing the canopy from acting as a sail. In order to improve the structural strength while maintaining certain structural depth and weight, mature techniques that have been widely spread in the wooden shipbuilding industry were introduced into the architectural field. The combination of glass fibre and resin was infiltrated between the wood fibres, transforming the original laminated tri- layer plywood into a light-weight super-high-strength composite material. Three vertical fins levered the canopy up above the columns, acting as a crane, which were then connected to the columns as a supporting structure. The construction framework that was used to lever the canopy into place also formed part of the final structure of the canopy, reducing construction waste and costs. The manufacturing method was constrained by the size of the CNC bed and the standard size of timber veneer and plywood panels, and the only-student-conducted fabrication and assembly had to take place within the school in limited space. Limited access and time brought further constraints on the scale, weight and assembly logic. The glass-fibreized wooden strips were shaved, polished, lacquered and air-dried over five times on both sides. The final finished surface was coated with a thin golden glazy lustre under overcast skies.